Melissa has been with us at the market since day one. Every week, she brings her professional traveling coffee bar and offers made-to-order espressos, cappuccinos, americanos, machiattos, lattes, spiced chai, steamers, assorted organic teas, and hot chocolate which shoppers can enjoy (with a market treat!) at our cafe tables. And she sells coffee by the bag to take home. She is passionate about coffee and loves to engage in any conversation about it. In fact, she wrote her honors thesis on coffee. This passion, led her to a career in coffee. 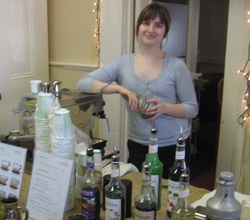 After managing a coffee shop in Hoboken for a few years, in 2008, she decided to create a full-scale traveling coffee bar, to provide a quality coffee experience in people's homes, events and other venues. For Melissa, brewing coffee is a mix of art and science. Her coffee beans and teas are organic and fair-trade. She carefully selects beans blended and ground to precise specifications. Her milk is organic and her paper goods are recyclable and are made of recycled, compostable, petroleum-free materials. For those lactose intolerant, she has special non-dairy creamers. As seasons change, she will offer a unique beverage, such as steamed milk with crushed fresh strawberries from the farmers' market. Melissa is available for parties, conferences and special events. There is nothing nicer than being able to offer freshly made-to-order espressos and cappuccinos to your guests. A stroll to her coffee bar at the end of the evening gives your guests a chance to stretch their legs and mingle with those they haven't spoken to yet. Not to mention Melissa is a lovely addition to any event. Visit her website for more information. P.S. Melissa also creates the hip and sultry music playlists for the market.